Will Domino's Pizza Produce a Tasty Quarter? Can Domino's keep exceeding expecations? Domino's Pizza (NYSE:DPZ) has been on a roll. Shares of the pizza maker are up 17% year to date versus the greater S&P 500's return of 1%. The impetus for Domino's overperformance was the company's fourth-quarter earnings in late February. The company reported a fourth-quarter 10.7% domestic same-store-sales growth figure and diluted adjusted EPS growth of 26.4%. Shares of the company shot up 13% as investors digested the positive report. With Wall Street, great operational performance is rewarded with inflated expectations. Analysts surveyed by Thompson Reuters have increased their consensus EPS expectations for the first quarter from $0.95 per share to $0.98. Overall, there have been seven EPS increases in the last 30 days from the 15 analysts surveyed. Can Domino's meet these increased expectations when it reports results for the recently completed first fiscal quarter? Domino's appears to be just as bullish as analysts. Last year the company added 133 net domestic stores, the highest number it's opened in 15 years. However, the more surprising figure was when these stores were opened. Per CFO Jeffrey Lawrence, transcript by Seeking Alpha, 88 of those stores were opened in the fourth quarter. Domino's appears to be a company continuing to shift to a growth mode in the United States. Adding in the international store count figures of 323 in Q4 and 768 in the full year, the company increased its total store count 901 units last year with 411 in the fourth quarter. Overall, the company grew its store count nearly 8% last year to 12,530 total restaurants. The vast majority of these stores will not count in Domino's same-store-sales figure in the first quarter, but will show up in revenue and EPS figures. The reason Domino's is able to continue to grow is many of the risks to the company simply haven't materialized. Domino's biggest risk is competition from established chains, single-restaurant operators, and new entrants. However, it doesn't appear as if any are stealing substantial market share from Domino's. After Chipotle Mexican Grill (NYSE:CMG) announced its Pizzeria Locale concept to much fanfare, the company only reported having three stores last year with plans to open "a small number" this year. Chipotle appears to be more focused on growing its eponymous storefronts in the intermediate time frame. 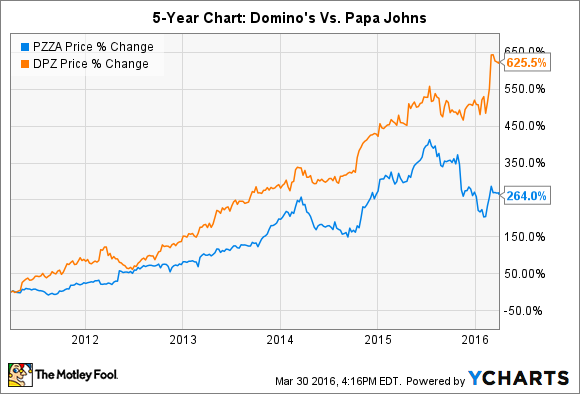 Over the past five years, both Domino's and Papa John's (NASDAQ:PZZA) have provided investors phenomenal gains. More recently, however, it seems Domino's is simply executing more effectively. For example, last quarter Papa John's reported systemwide comparable sales increases of 1.9% in North America and 5.3% in international markets versus the aforementioned 10.7% Domino's produced domestically and 8.6% abroad. Papa John's opened 230 total restaurants last year, or less than Domino's opened in the fourth quarter. While Domino's increased its total store count by nearly 8%, Papa John's only increased its store count 4.9%. Overall, it seems Domino's is firing on all cylinders. It's highly possible for the company to report another blowout quarter on the back of impressive comparable-store growth and contributions from new stores.